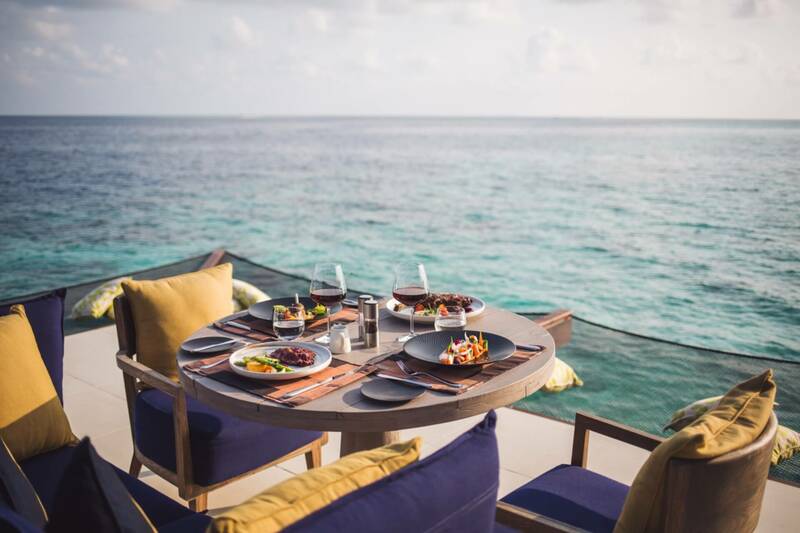 From casual dining at Breeze Poolside Dining & Bar and extensive buffet spreads at The Edge, to a feast of prime cuts paired with curated wine at specialty restaurant, Firedoor, you will be in for a gastronomical treat at Grand Park Kodhipparu, Maldives. Accompanied by unbeatable views, naturally. Situated next to the ocean, The Edge welcomes diners into its contemporary and open spaces designed to showcase unblocked views of its picturesque surroundings. Maldivian influences are reflected in the pine wood timber flooring, roof and ceiling features and extended to the furniture and décor items created by local craftsmen. A variety of seating from cosy indoor lounge seating to overwater private pods is available, ideal for group mingling or romantic dinners. Enjoy a wide selection of international culinary creations from The Edge’s extensive buffet selection which also features live cooking stations where seasonal specialities are prepared on demand. Set against tranquil, panoramic ocean views, this laidback pool bar serves lunch and light bites throughout the day. Serving up modern, light menus with contemporary interpretations of Asian and Mediterranean classics, as well as old favourites like burgers, pasta and salads, Breeze is the perfect venue to refuel throughout the day. At sunset, Breeze transforms into an easy-going resort bar where our inventive bartenders put together refreshing cocktails (and mocktails). Fine wines and light snacks also feature alongside some easy beats at sunset. Breeze is adjacent to the infinity pool with an adjoining wine cellar. Nestled in an intimate space away from the other resort facilities, the speciality restaurant sets the stage for a special celebration. Upon entering, be greeted by a hive of activity at the show kitchen featuring an impressive Josper grill, set to fire up your appetite. At the heart of the restaurant, schools of colourful fish swim idly in the lagoon adding to the carefree and relaxed vibe as guests dine in privacy either indoors or alfresco.